As a home business owner, I have my classes when it is convenient for me – and that’s during the day and at my home. In fact tomorrow Oct 17th, I have sessions at 10am and 1pm in Erie, PA. If you can’t make my monthly card class, whether due to time or to distance, my class handouts are free to anyone who orders in that month. For October, you will get an email with 3 Craftdoc CardClass pdfs – each with a picture, some alternate ideas, instructions, color combo and product list. 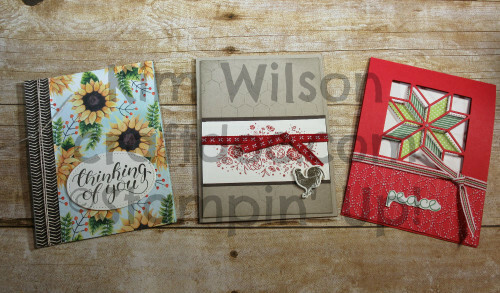 So hop on over to my website store and then check out these 3 cards. I love the flexibility of being a Stampin’ Up! demonstrator, besides all the other perks like the friendships, the discount, our magazine and lots of available ideas for these great color-coordinated products. Check out the Join the Fun tab at my website if you are ready to make some cash for the holidays, or just get all your crafting supplies at a discount.